The history of ERA and the story behind the development of the ERA Mini Turbo. If you need to get in touch with me you'll find all the information here. When Humphrey Cook founded ERA, English Racing Automobiles, in 1933 he soon realised that his company had absolutely no chance of beating the huge state funded Mercedes and Auto Union teams. The fledgling British company turned its attentions towards the Formula Two of the day, the 1.5 litre volturette class and that proved to be an enormously successful strategy. Now with ERA once again venturing into car production, they have adopted something of the same approach, starting with something well within their scope and hoping that it proves just as successful. The result is the ERA Mini, a very logical choice in that the company has good relations with Austin Rover, the Mini still has a certain cult appeal, and there's a fairly straight forward way of giving it a dramatic increase in performance without the company having to spend a fortune in engine development. The engine chosen is also an echo of ERA's past - just as they used a supercharged 1.5 litre engine for the racer, ERA have gone for forced induction with the Mini, fitting the turbo engine from the MG Metro. 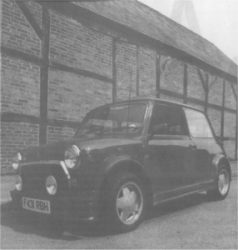 The ERA Mini, however, is far more than just an engine conversion, although just swopping the engines seems such a logical move that you wonder why there isn't a thriving cottage industry engaged in making demon Minis, like latter day John Coopers. As we'll see, there's rather more to it than just dropping in the engine and ERA are determined to do it properly, reworking other elements of the car to produce a car that can handle the extra power and performance as though it were made for it. Although out of the public gaze for so long, ERA have a reputation inside the industry to protect and have to get this car right as it has to be a success to allow them to carry on and build the next project, which will have far more overt ERA content. Nevertheless the foundation of the ERA Mini is an ordinary Mini City selected off the production line, painted and with glass fitted. Once that's arrived at ERA's Dunstable works, a team of three descends on the car and the conversion unfolds.
. The T3 is used in conjunction with that most traditional of instruments, an SU carb - in this instance an HIF 44. The blower produces the goods, to the tune of 94bhp at 6130rpm, along with 87 lb ft of torque at 3600rpm. Although that output is virtually identical to that of the MG Metro Turbo it doesn't mean that ERA have ignored the engine - far from it. Chassis development was carried out with 140bhp under the bonnet, the theory being that with that much power any handling or road holding shortcomings would become glaringly obvious. All that power sounds wonderful to us but it would clearly be too much for a road going Mini that's meant to have the same longevity and reliability as a production Mini, rather than enjoying a brief but spectacular career. The limiting factor on power, apart from safety, was the transmission - that old familiar in-sump four speed that's been around as long as the Mini and was never intended to deal with such torque. Consequently ERA spent a long time , tailoring the Turbo's, torque output and curve, to the transmission. Although the 1275 is no stranger to the Mini, fitting it with the turbocharger attached is quite another proposition. Induction and exhaust are on the rear-facing side of the engine and that means there's precious little space left between engine and bulkhead to accommodate the Garrett - in fact there’s none: and the transverse bulkhead has to be cut away in the middle and an open box section welded in to provide room. Even so the turbo is tucked away in the most awkward inaccessible place, one where no cooling air will pass over it and so great attention has to be paid to both water and air cooling. The Mini's standard little radiator couldn't cope, so there's an auxilary water cooler as well as an oil cooler. The former is mounted at the front of the engine near the clutch housing and the air flow past it exits through the wheel arch, courtesy of a vent that previously was dedicated to cabin ventilation (the air for that purpose is now fed via the scoop in the front air dam). Talking of wheel arches, if you look under the one on the passenger side, you'll find an air cleaner of ERA's own design and manufacture - there was simply nowhere else for it to go and even so the engine bay looks pretty crammed. It looks even fuller than it might due to the sound deadening kit which is an excellent addition to any Mini tuning conversion. 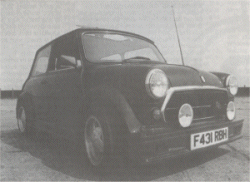 Considering that the original Mini was given a smaller version of the contemporary A-Series engine, on the basis that its little frame couldn't handle the might of over 900cc, the car has done exceptionally well to take all the tuning work and larger displacement engines over the years. It may have seemed that it was always craving more power than even the hottest of the Cooper Ss but, for the Turbo, ERA decided that much extra couldn't be entrusted to the standard wheels, tyres and suspension and those aspects were given close attention to try to ensure good handling, better braking and to avoid the torque steer that the blown engine would try its best to introduce. When fed with all the relevant data and objectives, ERA's computer decided that 13 in wheels, allied to various geometry changes, would do the trick. As ERA's John Taylor put it: “It's the first time the computer has come up with what proved to be the correct answer .” The contrast with the Mini's original wear is, as David Coleman would say, quite remarkable. That ran on tiny, 10 inch diameter wheels, just 3.5 inches wide - a stark contrast to the ERA's very smart 13 inch alloys which, at six inches, are very nearly twice as wide, allowing more conventional size tyres to be fitted. Not that ERA simply threw 13 inch low profiles tyres at it at random but carried out a great deal of work with Goodyear and, in the end, narrowed the choice down to between them and Dunlop; the Dunlop 165/60 Sports getting the nod despite having slightly less ultimate grip than the Goodyears because they had a more linear response near the limit, sliding rather than suddenly breaking away. Tyres and wheels alone were not expected to do the whole job and new track control arms feature at the front. They are longer than standard to give the desired 1.5 degrees of negative camber. That's hardly news in the world of Mini tuning of course; the car's been around so long that all such tweaks have long since been discovered and years ago there used to be adjustable track control arms allowing you to dial in exactly what amount of negative camber you required. That, along with the increased toe-out settings, is designed to minimise torque steer as well as helping cornering power (or it would if the car leaned through corners). The rear suspension is left alone, apart from the dampers, adjustable Spax being used all round; the spring rates are left standard but with such a taller wheel/tyre combination the car had to be lowered to avoid it looking particularly silly. One significant advantage of the larger wheels is that it allows very much bigger brakes to be fitted, 213mm dia vented discs in the front in this case and they are gripped by four-pot AP calipers with a dual circuit. That's a massive step up in braking power over any other Mini, not just in disc diameter but in pad area, and yet the rear is left standard. You'd be absolutely right in thinking that totally disturbs the braking balance front to rear but that was a deliberate ploy rather than any bizarre oversight. Now around 90 per cent of the braking is on the front wheels and apparently any more on the rear would run the risk of rear wheel lock up under heavy braking from high speed, given the Mini's front weight bias and the considerable weight transfer that must take place under braking, and with such a short-wheelbase car, the last thing you would want at speed would be an impromptu hand brake turn ...! That's the running gear sorted out but, wheels and tyres aside, you don't see any of those improvements from outside the car. Nevertheless there's no missing the ERA Turbo because the flamboyant body kit is designed by erstwhile Marcos and Probe concept car stylist Dennis Adams. The kit is quite distinctive, at the cost of making the Mini look even more squat and brick-like than usual. Visual impact aside, the kit is functional in that the front dam stops air getting under the car. It also houses the ventilation ducts and the wheel arches have to be extended to cover the larger wheels and tyres. Once those bits are in place you might just as well join them with the skirts. The interior is a rather more successful revamp though, with large swathes of Connolly leather covering console, fascia and steering wheel, along with the sides of the new seats. It's been a very long time since we could truthfully write: “the instrumentation is comprehensive” but for once that time-honoured hackneyed phrase is completely accurate as, in addition to the central 140mph speedo and tacho (with no red line) there's smaller dials for everything else: water and oil temperature, oil pressure, fuel contents, volts and boost level. That collection looks very smart indeed but the steering wheel rim obscures the boost gauge, fuel gauge and a bit of the volt meter too but at least they are all there. The greatest interior improvement, however, must be the seats which, although having the same H (or hip) point as the ordinary Mini seats, are no longer the traditional instruments of torture but proper seats, which promise to remain comfortable for far longer than the hour or so we spent in the car. They are not ‘off the shelf’ aftermarket seats either, but Metro ones cut and shut to suit the Mini's narrow confines. The cloth and leather covering is to a very high standard and when the side bolsters switch to production spec, which has slightly more solid foam, they should be even more supportive. ERA chose the wide open spaces of Bruntingthorpe for their press introduction (although the likes of Editor Ward had had the opportunity to drive it on the roads around Donington at the recent SMMT test day described in the July Issue); that gave ample opportunity to explore the Turbo's full performance. ERA estimate that top speed should be 115mph but with 105mph showing as Bruntingthorpe's runway ran its course, it seemed cruel to keep the throttle hard down any longer. There was more to come, but not all that much more. You wouldn't want to keep any Mini at that speed for very long but the added sound proofing meant it was more mechanical sympathy that dictated easing off rather than suffering eardrums. Such performance does at least mean you can now contemplate long high-speed motorway journeys, cruising easily at 80 plus (absolute screaming top speed of an ordinary Mini, by the way, is 86 mph). More crucial is the increased acceleration that the turbo brings and here ERA's claims are if anything conservative; 6.04sec is claimed for the 50 -70 span while we were well under the 6 second. Although the 30 - 50 and 40 - 60 times in top are pretty good at 10.5sec and 9.4sec respectively, it does indicate that the Turbo needs a little while before it really begins to fly in fourth, which is just as you would expect from the combination of its 3.21:1 final drive and those 13 inch wheels (which give a mph/l000rpm figure of over 18mph). Maximum boost of 7psi for example does not come in until 6000rpm, so although ERA's publicity material states that: “mid range torque has been matched by careful testing on the ERA testbeds to suit the required performance of the car” and you might think that means it's been given good low-down performance, that's not quite the case. 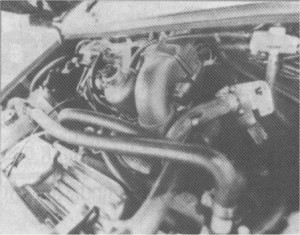 Look at the Metro Turbo and you'll see that there maximum torque comes in at 2650 rpm - in the Mini that's delayed until almost another 1000rpm and that's how this Mini feels; it has to be kept on the boil to give its best and then its performance is superior to the Metro Turbo from whence comes its engine. At just under 9 secs for the 0-60 dash, a second is knocked off the Metro's time while nearly 3 seconds is taken from the 50-70 times in third gear (5.2 rather than 7.9) and the Metro, while not the fastest of today's mini hot hatches, is no slouch. Transferring that power to the road is no problem at all, as ERA have done an excellent job in avoiding torque steer. It is possible to provoke it, with very sudden acceleration past 5000 rpm on a downhill slope, for example, but in general it's no problem at all. The suspension changes haven't compromised the handling either; the Mini is still as much simple fun as ever it was with no extra weight introduced into the steering. It still goes just where you want, displays no lean through corners and yet has higher levels of grip. Brake hard and it stops in short order, although you're certainly conscious of all the braking being on the front which squirms much like the old Alfetta GT which once graced CW Towers and had the usual terminal defective rear calipers. On the other hand the back doesn't lock whatever you do ... ! Wheel size and proper damping has a lot to do with the improved ride (although the excellent seats contribute a great deal to the extra comfort) which is claimed to be a quantum leap over that of an ordinary Mini. 'Leap' probably isn't the kindest word to use there, however, as the ERA Mini still suffers that absolutely typical vertical pitching that tells you you are driving a Mini and nothing but a Mini. This author hasn't driven a Mini for just on 10 years now, so couldn't test the truth of ERA's contention that even that pitching was vastly improved and that now it was at least always vertical instead of front or rear. Pitch it may, but the worth of the suspension changes is shown in that even on fairly rough roads the ERA isn't thrown off course. Overall it's very well built, well sorted, quick enough for you not to feel at all embarrassed by far more modern demon minis and still terrific fun at £50 shy of £12,000, however, it's in quite a different category - £3000 more than a GTti Daihatsu for example - but one where there's apparently no shortage of buyers as £2000 deposits are already flooding in to ERA.